If your small business hasn’t quite figured out how to get organized during the regular shopping season, what’s to become of you on Small Business Saturday? Last year, over 100 million people patronized their local businesses and shopped small on the Saturday after Thanksgiving, and even bigger numbers are expected this year. When everyone is beginning to emerge from their tryptophan and Black Friday-induced food/shopping comas, will your small business be ready? Making sure you have ample staff on hand to help with unusually large crowds on SB Saturday can be challenging. Many people on your crew may be out of town or have family commitments because of the holiday. Decide early (read: several months in advance) who will be working that day, and offer juicy incentives like holiday pay or an extra in-store discount. You can also hire temporary employees to help on this day if your regular staff is too small. Make sure you have ample time to train the newbies, though – the last thing you’ll want to be doing when your store is packed with customers is explain how the cash register works. When figuring out how to get organized for SB Saturday, involve your partners, your assistants, and your staff in a team-building, brain storming session. Talk about what worked last year, and what needs to be improved upon. Let everyone share their thoughts and concerns, and contribute to a strategic plan that everyone can get excited about. If it’s your first SB Saturday, congratulations! Your status as a brand new business is a fantastic marketing opportunity to introduce yourself to the local community. You don’t simply need to know how to get organized in terms of assisting and processing payments of extra customers. SB Saturday is all about thanking your customers for shopping small, and that means giving them a little something extra. Small handmade gifts, discounted memberships, coupons, free consultations, and raffle prizes are all excellent ways to make SB Saturday a true event. It may seem counter-intuitive to give away some of the proceeds from what may be your biggest sales day of the year. But one day isn’t going to make or break your business. On SB Saturday, when all eyes are on you, you have an opportunity to show your community not only what your business sells, but what it stands for. Take advantage of your day in the spotlight by choosing your favorite local charity, and partnering with them to make this day a “win-win” for everyone in town. We know you’re using e-receipts and digital accounting software, but sometimes when things get really busy, even virtual receipts can get lost in the shuffle. Ask your employees (you know, the ones you’re paying extra and thanking profusely) to stay late after your business closes, and to help you get organized. Making sure all transactions are accounted for, and making a quick assessment of your inventory, will save you tons of time come Monday. Heck, you may simply need help cleaning the place up. Sometimes a little sweeping and vacuuming are all that’s needed when trying to figure out how to get organized. At the end of the day, when your local customers have shopped small and your small business has made a splash, take your staff to dinner to celebrate. Yes, it’s a business tax write off, but it’s also a way to say “thank you” for a (very) long day that will increase your business throughout the following year. Just make sure you go to that mom ‘n pop Italian joint around the corner, and not, um, the Olive Garden. 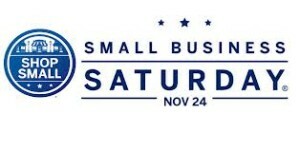 How is your Small Business Saturday different from the rest of the year? Shoeboxed Featured on The Huffington Post!